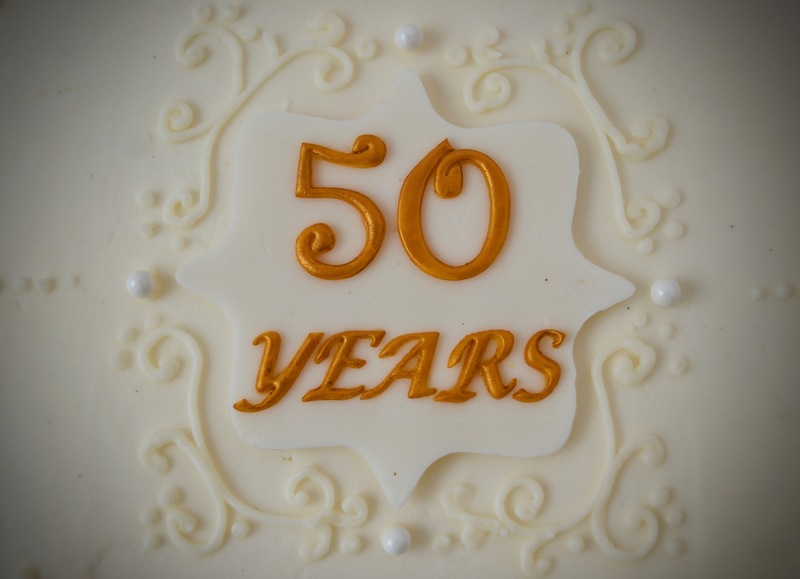 I had the extreme honor to make this 50th anniversary cake for a friend whose parents were celebrating this golden milestone in their lives…it always brings me pleasure to create special occasion cakes that mean so much to those who get to enjoy them. The cake was a 12″x12″ square vanilla bean cake filled and iced with vanilla Swiss meringue buttercream and decorated with buttercream scrolls and dots . 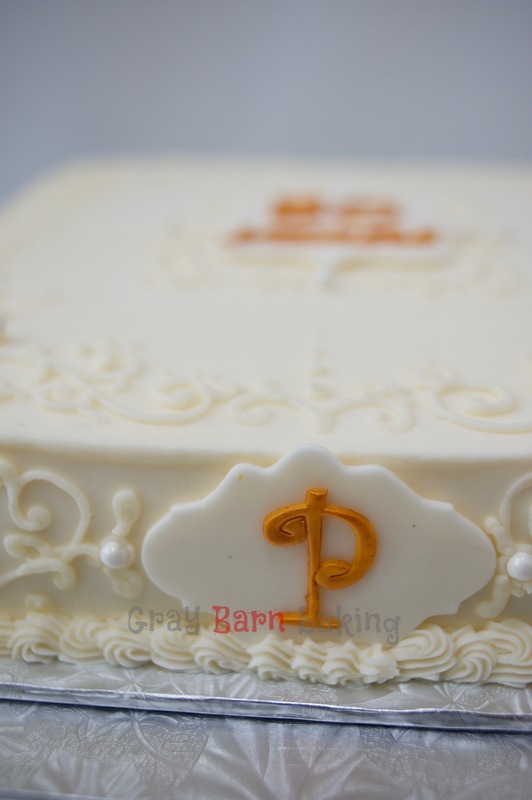 The “P” monogram and “50” plaque were made from homemade marshmallow fondant. I used cutters and pale yellow fondant to cut out the letters and numbers and then painted them with edible gold paint before securing to the fondant plaques with sugar glue. In the end, I added a few white sugar pearls to dress it up a bit. Happy 50th Anniversary, Mr. and Mrs. P, it was an honor to make a cake for such a special occasion!! I love, LOVE, LOVE this wedding cake! I think the rustic in me comes out when I’m asked to create a one-of-a-kind cake for a very special couple who love simple beauty and charm, but don’t really have a specific idea in mind for their cake. This is just what I’d design if I were designing my own wedding cake (I actually can’t even remember having a thought about my wedding cake except it was the Christmas season and the colors were green and red–yuk). This is a 3-tiered design (12″-9″-6″) with sour cream chocolate cake filled with salted caramel…yum. The icing is Swiss meringue almond buttercream put on with a textured, rustic look. The flowers are real and match those used at the reception. I added the raffia border on each tier to pull the whole look together. The groom’s parents were actually hosting a reception in the area after an earlier wedding for the couple on the West Coast. I heard from the groom’s mother that the cake fit their personalities perfectly (and was delicious to boot :0). Congrats to the lovely couple and here’s to a great happily-ever-after! I made this cake for a daughter of a dear friend for her 1st Communion gathering last Spring. As confirmation and 1st Communion celebrations are being planned with the coming of Easter and Spring, I thought I’d share a few ideas. This cross-shaped rosette cake is one of my favorites…simple elegance comes to mind whenever I make it. This cake was sour cream vanilla cake with vanilla-bean Swiss meringue buttercream used to pipe the delicate rosettes. If you haven’t tried Swiss meringue buttercream, it is not as sweet at traditional buttercream but much more smooth and silky, just perfect for piping rosettes. And best of all, it tastes heavenly. The pink banner was hand cut from homemade marshmallow fondant and left to dry draped over some rolled up paper towels to add the illusion of movement. there were also a few dozen chocolate cupcakes piped with the same rosette for the dessert table. Here’s another 1st communion cake idea for a smaller gathering. This is an 8″ 3-layer double chocolate cake with chocolate mousse filling. The icing is vanilla-bean with white swirls piped on a smooth-iced buttercream cake. The crosses and lettering are cut from homemade marshmallow fondant. Simple and elegant. I love these delicate, blush pink cross cookies I made for a little girl’s 1st communion last Spring. They’re iced with fresh lemon Royal icing and piped with white dots and swirls. Here’s an idea for cupcakes with white chocolate crosses and pale blue buttercream swirls. And another 1st communion celebration double-layer sheet cake I did a few years ago. The Royal icing crosses and cornelli lace piping details really dress up an ordinary half-sheet cake. It’s always such a treat for me to creat these special sweets for such milestone events. Congrats to all the 1st communion and confirmation candidates out there!